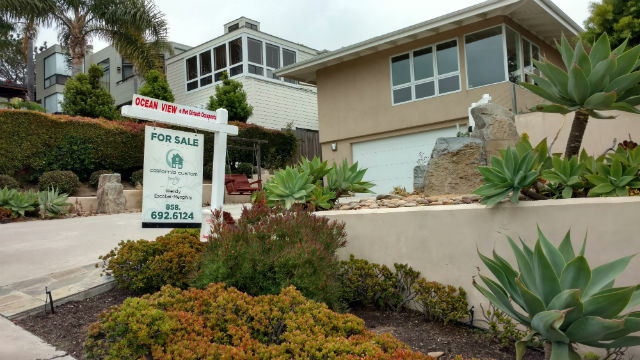 California home sales dipped in November from a year ago and a top economist warned the Republican tax bill nearing passage could slow sales in high-cost markets like San Diego. The California Association of Realtors on Monday reported sales of single-family homes declined by 0.8 percent in November compared to a year ago. Sales were off even more at 6.1 percent in San Diego, though the local median price increased to $619,900. “While high-priced markets have performed well in recent months, sales remain lackluster in the lower-priced segments as the supply of affordable homes continues to shrink,” said California Realtors’ President Steve White. He cited Silicon Valley, San Francisco, Los Angeles, Honolulu and San Diego as the five metropolitan areas most likely to experience lower sales. In California, the latest report showed sales at a seasonally adjusted annual rate of 440,340 units in November, compared to 443,960 in November 2016. After reaching its highest level in a decade in August, the statewide median price was essentially flat but remained above the $500,000 mark for the ninth straight month. The $546,820 November median price was 8.8 percent higher than the $502,490 recorded in November 2016. The Republican tax bill is expected to pass both houses of Congress later this week and be sent to President Trump for signature.